If you find this site useful and would like to make a donation to help towards the running and development costs please click on the button below. 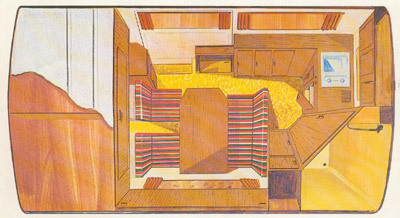 The first brochures I can find for the VW Westfalia LT camper are from circa 1975. They show that there were two versions available. Initially they were known as the standard model and the deluxe model. No price info yet so if you have any information or price lists for the early Volkswagen Westfalia LT camper please send them to me. 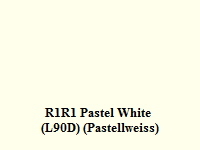 R1R1 Pastel White (L90D) (Pastellweiss) (with white roof). 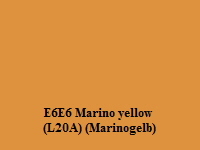 E6E6 Marino yellow (L20A) (Marinogelb) (with white roof). 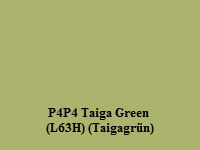 P4P4 Taiga Green (L63H) (Taigagrün) (with white roof). However I have no official colour info yet so if you have any information for the early Volkswagen Westfalia LT camper please send it to me. 1) 2 flame gas cooker and stainless steel sink. 2) 45 litre fridge working from 12v, 220v and gas. 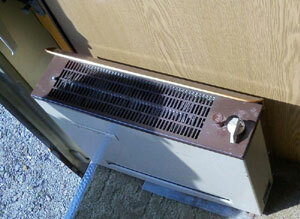 4) Trumatic night heater SB 2000. 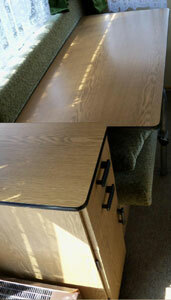 5) Long rear seat banks running along each side with continuous back rests. 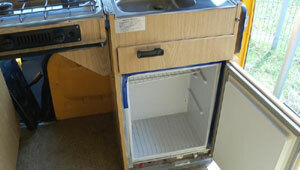 10) Standard layout version had washing cabinet with washbasin inside wardrobe that can be seen at rear of photo below. 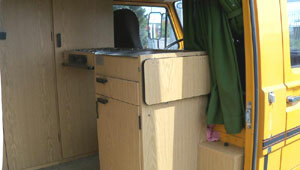 11) Standard layout version had opening rear doors for easy in and out access. Waterproof shower cubicle with a folding wash basin, mixer tap and shower fitting. 75 litre freshwater tank in vehicle. 75 litre waste water tank under the vehicle. Upholstery - From brochure is a multi coloured stripe pattern. Curtains- From brochure they are a light brown colour. Roof exterior was in white. Internal headroom height was 186 cm. Flooring- From brochure is a brown beige carpet. Door trims - No information yet! Double glazed windows in the living area. 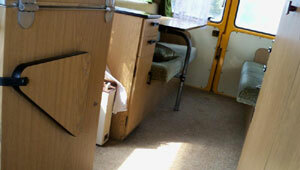 No option info yet so if you have any information for the early Volkswagen Westfalia LT camper please send it to me. 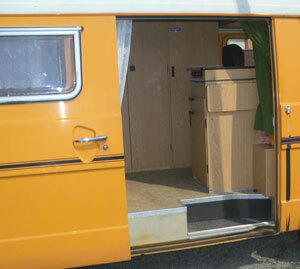 No accessory info yet so if you have any information for the early Volkswagen Westfalia LT camper please send it to me. Please note that some links take you to an external site called vwpix.org, which is an excellent source of sales literature for all versions of VW camper van. Most of the brochures are in German language as this was the main market. 1975 VW Westfalia LT Camper Sales Brochure Prospekt (2 Pages Colour). 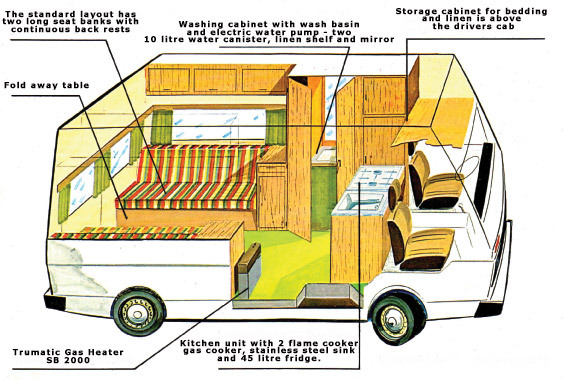 1975 VW Westfalia LT Camper Sales Brochure Prospekt (4 Pages Colour). Following on from the VW LT28 Campers that were called the “Standard” and “Deluxe” models came two new improved models known as the “Salzburg” (similar to the “Standard” model) and the “Como” (similar to “Deluxe” model). To get notifications when this site is updated subscribe to my VW Camper Blog or Follow Us on Facebook.